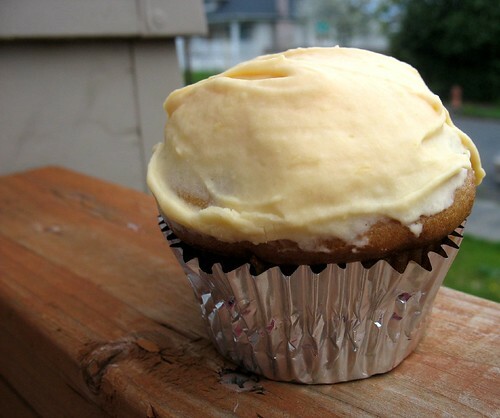 i purposefully used an almost identical recipe for the mango cupcakes for simplicity sake. you can easily whip up a double batch of unflavored batter and then seperate add the diffrent purees into the mix. i loved that these came out with a really strong, not too sweet mango taste. mix the oil, peach nectar, and vanilla extract into the bowl containing the soymilk and vinegar and then slowly add the wet ingredients to the dry ingredients and blend. add peach puree and continue to blend. bring cream cheese and butter to room temperature and beat together until creamy. add the mango puree. again, the puree will effect your ability to get a really stiff frosting, but i really think that nice strong mango flavor that came from using two mangos was worth a kind of goopey frosting. my coworkers seemed to really love these as well as the strawberry ones. i think the key to this was using fresh mango, ripe in the frosting. you could try it with canned or frozen, but i cannot promise the same effect and delicious-ness. In the frosting you mention cream cheese, but it is not listed in the ingredients. How much? Thanks! Hi,I just wanted to let you know that i used this recipe today and I absolutely loved it. The recipes that you have posted are amazing,and inspire me. I love cooking so much and love these recipes. I live in Rhodeisland and its going to be a horrible winter,but Im happy ill be inside cooking great stuff.